Kids will flip for this Maisy novelty book! Now reissued in its original size, with a bold new design. 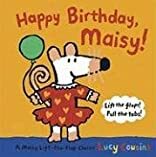 From their tactile matte-and-gloss covers to the brief guidelines for parents on the back, these lift-the-flap, pull-the-tab favorites now have a whole new look -- and are sure to have instant appeal for both Maisy fans and grown-ups who love them.